Having already transformed the front garden, we were delighted to be asked back by our clients to make-over the back garden. 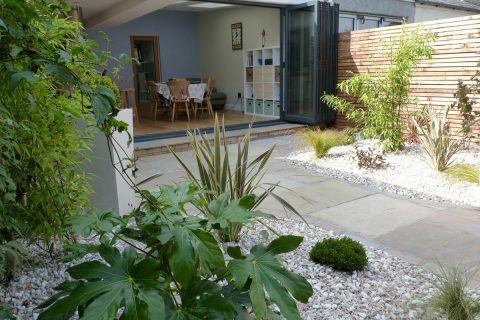 A new extension had left the garden needing to be upgraded and the clients wanted the garden to be modern but low maintenance. 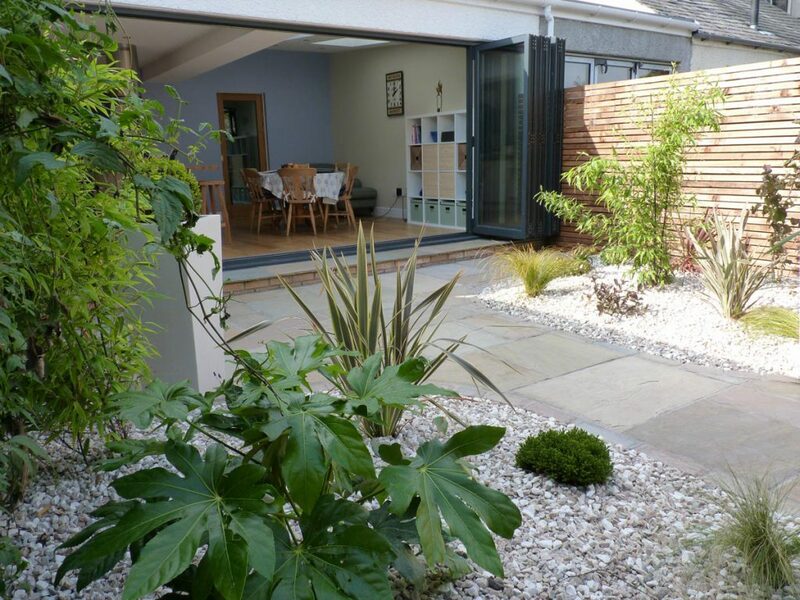 "The new contemporary garden works really well with the new extension and the bi-folding doors"
Creating seating areas was our first focus. The sunny back corner of the garden was chosen as the main dining patio with a smaller patio incorporated beside the house for morning coffees. 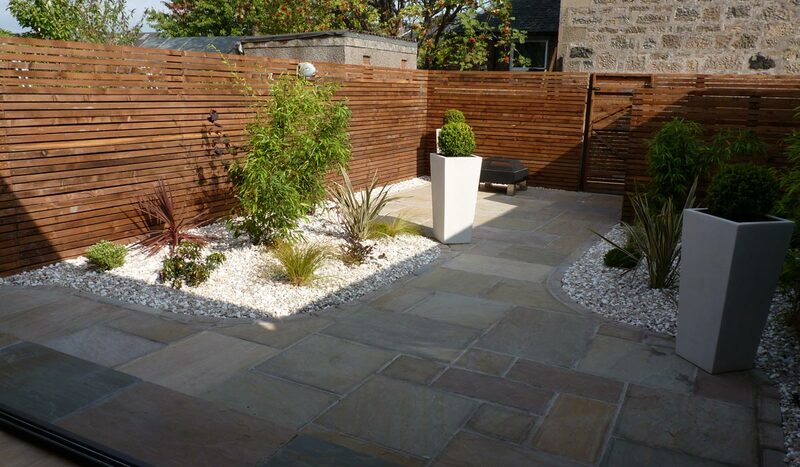 Both patios link together in lovely curves using natural sandstone with matching sett edging. 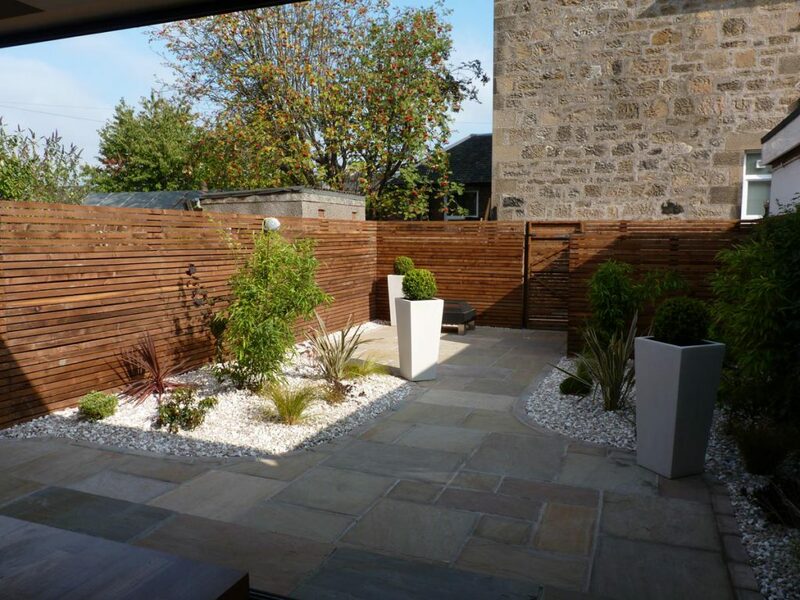 To create privacy and to transform the garden into a contemporary courtyard, narrow timbers were used to create a modern horizontally slatted fence. 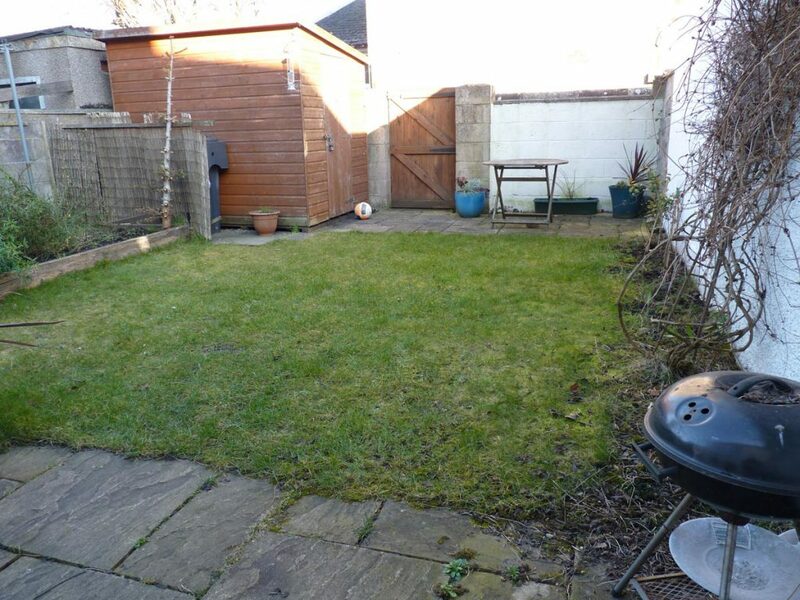 The same timbers were used to create the new utility area and matching gates. The utility area was carefully planned to allow space for a new locker shed, the various bins as well as some space for other essentials. 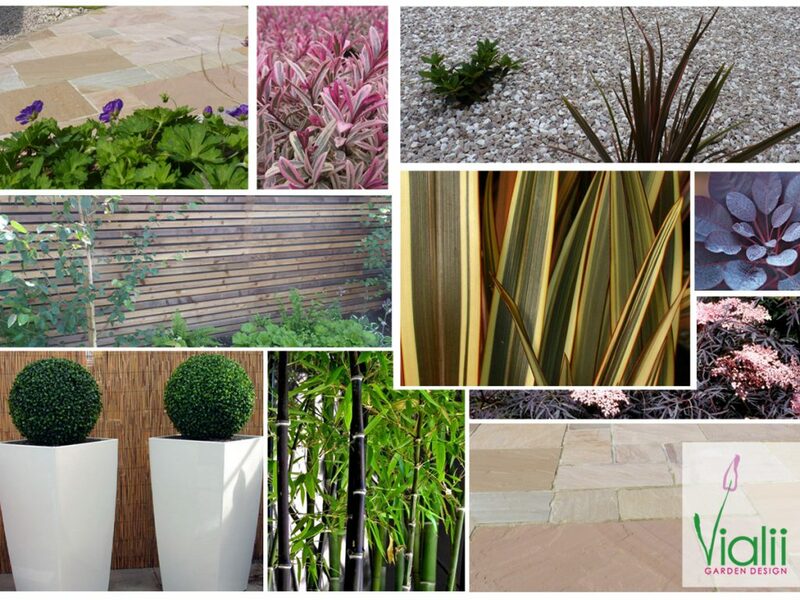 To keep the garden low maintenance whilst keeping the contemporary look, “Cavelston Sunrise” gravel was used around all the borders. 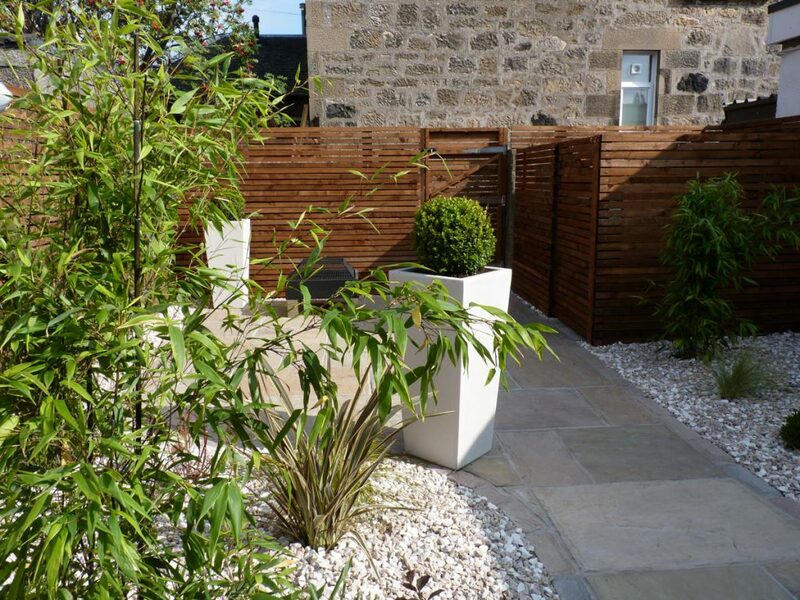 Tall, polystone planters were incorporated into the design, which create a strong statement and link the different areas of the garden together. 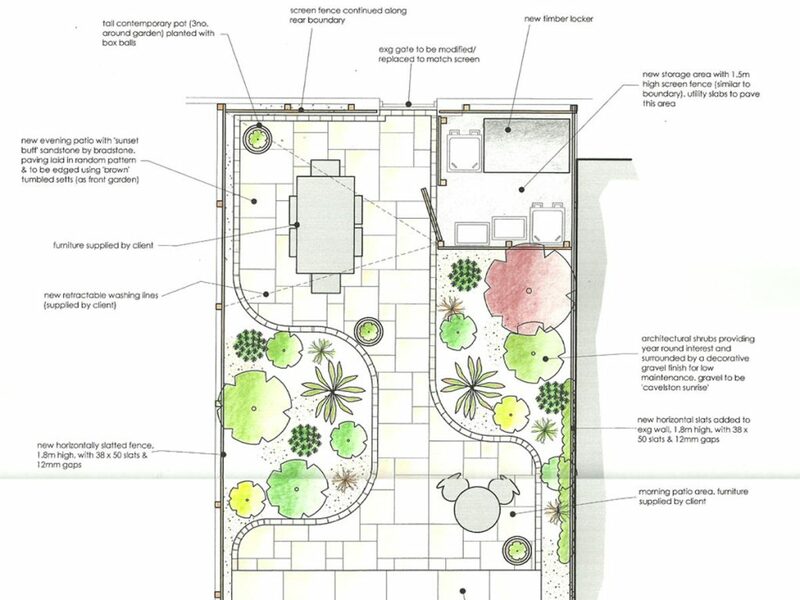 Low maintenance and structural planting was chosen for this modern courtyard garden. Shrubs such as fatsia japonica, corylus contorta, phyllostachys nigra and hebe create structure and year round interest. Splashes of colour come from azalea, hydrangea, weigela and lavandula. The buxus semperviren balls finish off the new planters perfectly.